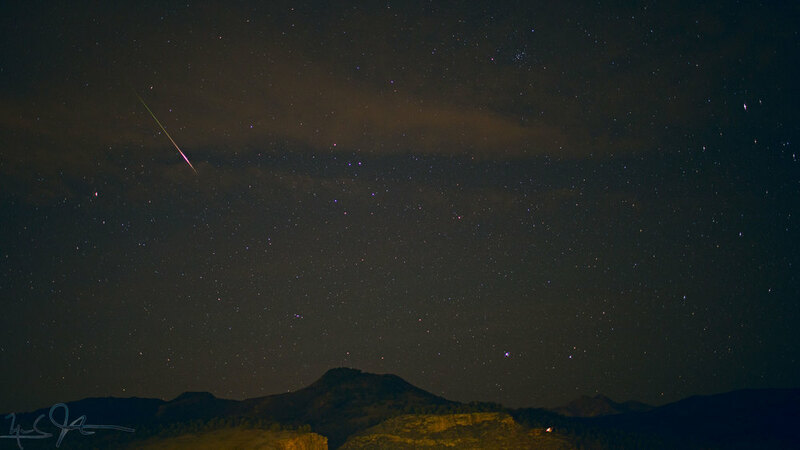 22 Jan 2012, 5:07 AM MST: A shooting star over Lyons, CO, appears in a single frame of a time-lapse photo sequence. A close-up is shown below. There are at least half a dozen shooting stars in the clip below, a time-lapse sequence shot between 3:15 and 7:30 AM. The one above, the brightest, occurs 44 seconds into the clip. Smaller ones occur at 00:19 near the center of the frame and at 00:23 in the lower middle part of the frame [these may be hard to see at the resolution displayed here]. In addition, various aircraft and satellites can be observed especially between 00:58 and about 01:12. Link. Published on January 22, 2013 by Mark Johnston.